Thank you for giving our chapter a great year! The year was successful because of YOU-- all of the generous professionals who volunteered your time to make the events and activities great. Many leaders filled more than one role, but I will mention each name only once, to save space. AFP-GLAC Board of Directors: Yuri Casco, Mike Driebe, Wayne Herron, Jody Short, Liz Birlet, Mauria McPoland, John Fasano, Patricia Ostiller, Katie McDonald, Stacy Capoot, Lela Diaz, Melanie Elliott, Lupita Garza, Terry Monteleone, Felicity Palmer, Heather Tunis, Jeanne Warlick and Dan Witzling. Regional Philanthropy Conference Committee, Julia Scheibmeir, Chair, Hannah Berger, Barbara Bushnell, Cassie Carter, Jennifer D’Alvarez, Jennifer Ellspermann, Eileen Harris, Robin Harvill, Susan Hubbard, Punita Khanna, Tiffany Leung, Cynthia Mikimoto, Adrianne Phillips, Courtney Rheuban and Andrea Salazar, plus board members already mentioned above. And I know there were even more: those who welcomed guests at the reception table, extended a welcome to a visitor or worked behind the scenes. You too made a difference in the success of the chapter. Thank you so much! I am excited about the year ahead, under the leadership of Yuri Casco and her board of directors. Together with your participation, we will continue to make AFP-GLAC the leading community of fundraisers who support the sustainability of all types of nonprofit organizations in our region. Please join us at the end-of-year holiday luncheon Tuesday, December 11, and I’ll see you all next year. 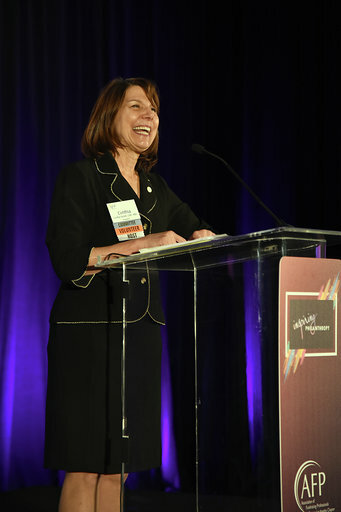 National Philanthropy Day and Regional Philanthropy Conference Chair, Julia Scheibmeir welcomes attendees. 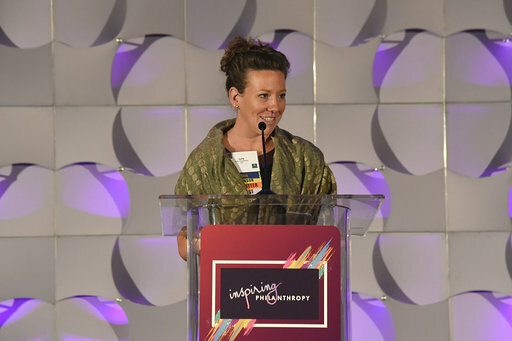 Keynote Speaker, Melanie Lundquist, inspires conference attendees during the opening session. For more photos from the day click here. 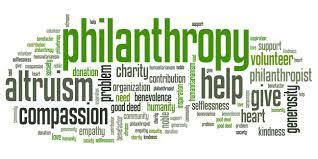 Many thanks to everyone who attended our Regional Philanthropy Conference and National Philanthropy Awards Day Event! Congratulations to our Award Winners and a BIG Thank You to our Chapter Event Committee, our Sponsors and our Speakers! ALL OF YOU helped to make this a great event and we look forward to seeing you again next year! Please go to the following link to see the fantastic photos from the event, courtesy of Joan Fuller Photography! Click here for the CFRE CE Tracker. Join in a festive holiday networking hour before our special inspirational luncheon. Catch up with friends and colleagues as we draw a close to 2018. Also, one lucky attendee will have the chance to walk away with a one night stay in a deluxe guest room at the JW Marriott Los Angeles! Amy Fogerson and Brian Palmer will share the unique story of Street Symphony and the Urban Voices Project – a story of how professional musicians engage members of the homeless community in life-changing, collaborative musical experiences. Registration closes December 7th. Save your seat today! Click here to register. 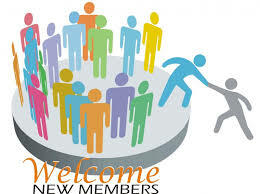 You can join AFP today! Direct Your Year-End Giving to support our AFP GLAC chapter! Your support to the AFP GLAC Chapter Fund has a direct impact on you as a member and all of the chapter’s members. 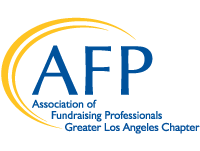 Funds raised in the chapter fund provide scholarship opportunities specifically to AFP GLAC members for events such as the AFP-GLAC Regional Conference, the AFP International Conference, AFP-GLAC development seminars, and more. Investing in the Chapter Fund is just another way to invest in your own professional development! To support the chapter today, click here. Every gift counts! A big Thank You to all who participated in AFP-GLAC’s Ethics Education this past year, whether by attending one of our Eye On Ethics programs, submitting an ethical dilemma, or reading one of our “Conversations With…” articles online. 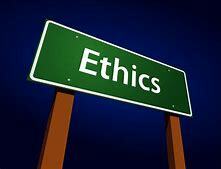 Ethics is an important part of fundraising and we are grateful for your interest. We are excited about continuing Eye on Ethics and Conversations With… series in 2019. Stay tuned! As always, if you have an ethical dilemma you’d like to share, please send us an email with the dilemma and how you solved it, along with whether we can mention your name, and your dilemma may be used for one of our programs! 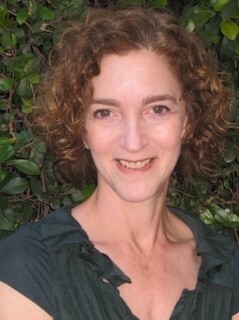 Please send your story to Melanie Elliott, Ethics Chair at melhelliott@gmail.com. You may have seen an announcement in our October Newsletter that AFP International launched a new website on Monday, November 5. The new website address is www.afpglobal.org. See our upcoming newsletters for more details!